New Age Laboratories is proud to partner with GeoSyntec Consultants and several environmental consultants on various NASA Space Center projects. Our chemists have worked with these clients to investigate and delineate legacy environmental issues on expansive bases. Specific projects range from vehicle pumping stations to launch sites and more. Through these contract-based projects we have worked at Kennedy Space Center, John C. Stennis Space Center, and other NASA facilities. 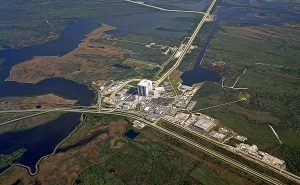 Geosyntec implemented a combination of remedial measures at NASA’s Vehicle Assembly Building for a chlorinated solvent source area and plume. Learn more about this investigation and groundwater remediation. Contact us to learn more about our work and what we can offer you! New Age Laboratories reacted quickly and was a long-term partner in the efforts to remediate the Enbridge oil spill of 2010. When the Enbridge pipeline near Marshall, Mich., ruptured upwards of 1 million gallons of crude oil flowed into the Kalamazoo River. We were one of the first response contractors to this emergency, arriving on site in less than 8 hours to begin testing with our mobile lab services. For more than three months after the spill New Age Laboratories’ chemists worked on-site and around the clock, seven days a week to help accelerate and support clean-up efforts and restore the Kalamazoo River. NAL initiated the use of the EPA’s FALCON protocol to statistically fingerprint the released product in order to quickly and verifiably distinguish between the released crude oil and other petroleum products or organic sheens being collected by thousands of response workers along a very heavy trafficked water way. Contact us to learn more about this project and what we can offer you!